Did Weasyl open to the public? I thought they were going into closed beta testing for selected users this weekend. The site was accessible to all, but only registered users could login; the invitation system was temporarily disabled. Weasyl, just another FA clone which will die a lonely death. To think Arcturus believes he is in any way a "leet h4x0r" is hilarious on face value. Well, Weasyl was a nice idea, too bad it won't last. We'll see. There were bound to be some issues, though the pressure of donors may have encouraged them to release sooner than they might have otherwise. I was not aware Arcturus was involved in any way with Weasyl. This would be the person linked as example of those probing for vulnerabilities. Ah, well, my guess it's more a tough love thing on their part. Or a test to see whether they'll go about fixing things. If that's the case they are, that's what beta's are for. No skin off my teeth... as long as the days of down time don't count toward the "paid account" status of people who donated. I don't normally comment on this sort of thing, I stumbled onto this and just wanted to mention that paid account timers won't start counting till we come out of beta, in other words any premium time purchased isn't counted until after we open to the public in general. Up now down again for the weekend. EDIT: Oh wait it came back up while was sleeping. All around it's up and down. Will Crusader Cat and Lupine Assassin be registering here? I wouldn't attend a bar at which Bryan Fischer and Bernie Madoff were regulars; I won't frequent a website that lets Reilly and Greenwald just wander in, stinking up the place. No offence. I wouldn't attend a bar at which Bryan Fischer and Bernie Madoff were regulars; I won't frequent a website that lets Reilly and Greenwald just wander in, stinking up the place. If you were to convert this sentiment into a strict rule (i.e., not patronizing establishments which have as customers anyone whose public actions or beliefs are in stark contradiction to your sentiments), I'd bet that you wouldn't be able to go anywhere, at least given the wide net you seem to have cast. I don't want to say 100% hand-coded, but I think many parts are. I'm getting my impression from what Kihari has said in, for example, this forum post, where he talks about considering a password hashing module as opposed to his own code. This suggests to me that he has hand-coded other elements of the accounts system as well. @tilton_raccoon @weasyl In a nutshell, Python, Postgres, lighttpd, and webpy. webpy appears to be a pretty thin framework - more a utility library than a high-level website-in-a-box. It will be down for the remainder of the week. 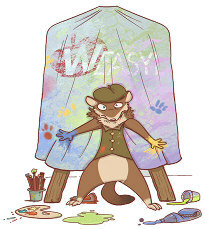 Weasyl is back up, with a laundry list of fixes.